Things aren't looking good for Sprig, who is packed into a fast-moving truck with dozens of other pigs. He doesn't know where they're going but his nose knows there's something better out there. So with one dramatic leap, or really more of a tumble, Sprig sets out on a pig-centered adventure that leads him to his new best friend, a girl named Rory. Inspired by true events, this light-hearted tale introduces kids to an intelligent and inquisitive pig who finds his way to a good life. The book includes a bonus section called More About Pigs, where curious readers can learn that pigs are smart enough to play video games, enjoy sleeping in cozy pig piles, run really fast, and other amazing facts. Sy Montgomery, author of The Good Good Pig, said of the book: "May Sprig help people to see what wonderful individuals pigs truly are." Peek inside Sprig the Rescue Pig here. 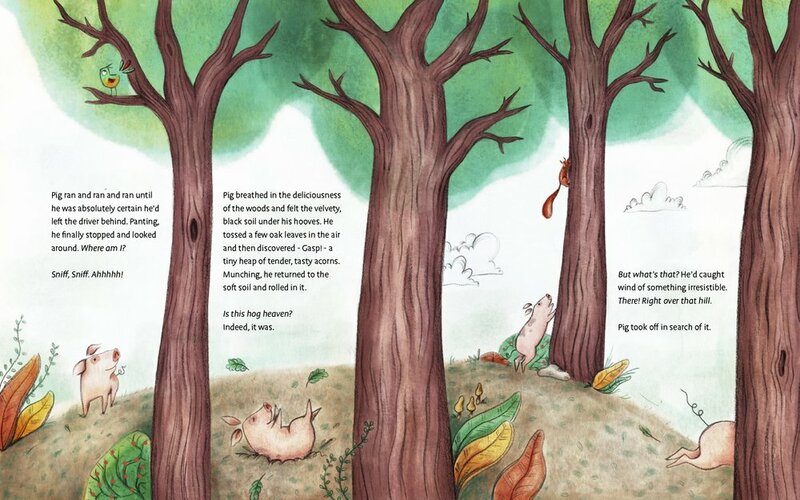 Sprig the Rescue Pig is the first children's book in our series on farm animals. Our second one Gwen the Rescue Hen is also on sale now. ORDER NOW AND YOU’LL RECEIVE SIGNED COPIES OF SPRIG AND GWEN. Leslie at Charlie’s Corner in San Francisco with Bix, who plays a supporting role in Sprig and Gwen. 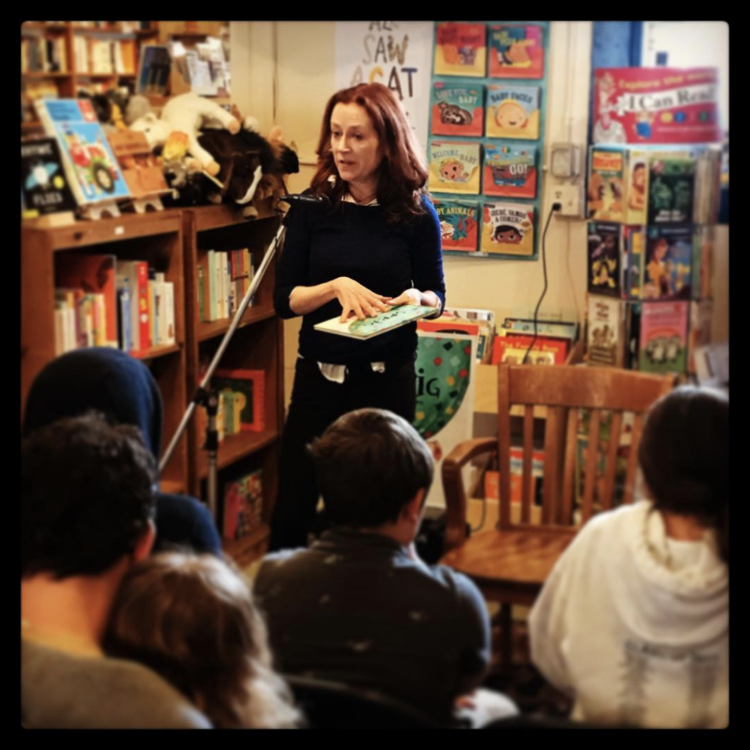 Author Leslie Crawford read before a group of children at Folio Books in San Francisco. Leslie Crawford meets a real-life Rory (and her mom Tammy) at Oakland VegFest. The book, beautifully illustrated by Sonja Stangl, shows Sprig on a crowded truck that is taking him and other unsuspecting pigs to the slaughterhouse. Suddenly Sprig smells something delicious — so delicious that he must have it. Sprig jumps out of the truck to find the source of the smell, launching him on a set of adventures that leads Sprig to Rory, a young girl who adopts him. Eventually, as he grows in size, Sprig moves to an animal rescue farm...While Sprig the Rescue Pig stays away from the harsh details of industrialized farming, the book helps readers see pigs as much more than delicious strips of bacon. SPRIG ticks every box for what I like to see in a humane education book: It's professionally presented, with appealing illustrations, sturdy binding, and a title on the spine (important if it's to survive and thrive in a library! ); it presents kind values without being didactic or off-putting; and it appeals to mainstream readers as much as it does to those already growing up in animal-aware households. Inspired by a true story, Sprig is a fun, funny, and beautifully illustrated adventure tale with a happy ending. Sprig in the house! With Mary Aguilar at the Agrarian Culture Center and Bookstore at the Wendell Berry Center, in New Castle, Kentucky. A journalist and editor for more than twenty years, Leslie Crawford has primarily written about health and education. It was thanks to her 12-year-old daughter Molly, who has never met an animal she doesn’t like, that Leslie developed an interest in writing about animals. Leslie lives in San Francisco with her two children, six chickens, four foster pigeons, and a bearded dragon lizard named Georgia. Sonja Stangl is an artist and illustrator from Austria. 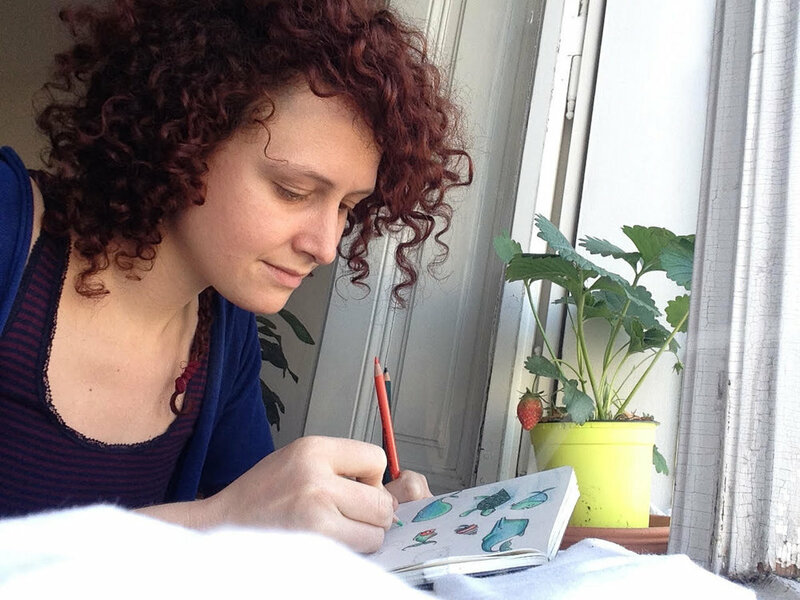 She studied multimedia art in Salzburg and now lives and works in Vienna, where she happily illustrates stories for books and animation. Learn more about Sonja at inky.land.